The stock market raced to new all-time closing highs over the summer, but the returns that stocks have produced broadly have been only a little better than their long-term average. The S&P 500 has produced total returns of about 11% over the past year, while the Dow Jones Industrials are up between 12% and 13% when you include dividends. However, for those looking for truly exceptional returns, there are some individual companies that have been able to help shareholders double their money since Sept. 2015. Below, we'll take a closer look at three of these high performers to see if there's any potential left for new investors in these stocks. The precious metals markets have rebounded sharply in 2016, and Silver Wheaton (NYSE:SLW) has benefited from the bounce in silver prices. The silver streamer has seen its stock climb 125% since Sept. 2015, with gains coming steadily throughout this year in following bullion prices higher. Silver Wheaton has worked hard to make it through tough times in the precious metals markets. Its streaming model actually allowed it to benefit from low prices, as they opened the door for Silver Wheaton to make lucrative streaming deals at favorable terms. Despite its name and its historical emphasis on the silver market, Silver Wheaton has diversified into gold-streaming agreements, and that has been a particularly lucrative segment of the industry for the streaming company to tap. With high margins, renegotiated deals with partners, and the prospects for continued strength in the gold and silver markets, Silver Wheaton could easily keep climbing from here. Data analytics has become a high-growth industry, with applications throughout the business world. Healthways (NASDAQ:TVTY) has sought to take advantage of data analytics in the healthcare field, offering employers and health-related entities well-being and wellness services to try to cut overall healthcare costs. The stock has jumped 107% over the past year, and most of those gains have come in the past two months, reflecting the building excitement for its future. In particular, Healthways announced in July that it would look at measures to restructure its operations, including the sale of its total population health services business. Although the sale produced an impairment-related loss when Healthways reported its second-quarter financial results, investors nevertheless were pleased to see the company focus more closely on its remaining businesses, which include the Silver Sneakers and Prime fitness programs. In addition, efforts to boost cost-saving efforts should also help Healthways' bottom line. Overall, with personnel changes near the top of the operation and ongoing efforts to streamline the business, Healthways has plenty of potential to get even better. The video game industry is big business, and NetEase (NASDAQ:NTES) has been a longtime winner. The Chinese company has seen its stock climb 116% over the past year, although performance throughout the year has been a bit volatile. Even as the Chinese economy has slowed, NetEase has continued to squeeze increasing revenue from the market. In its most recent quarter, NetEase nearly doubled its revenue in local currency terms, and adjusted net income also climbed by nearly 100% when you use local currency comparisons. Efforts to capture the mobile gaming market have been successful, and NetEase has also found ways to stay ahead of its competitors with premium content and innovative technologies. With new collaborations and a healthy pipeline of future releases, NetEase could keep posting wins well into the future. 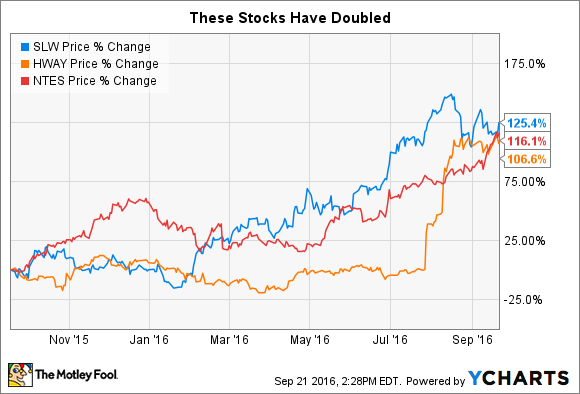 Few stocks are able to double, and it's even rarer for a stock that has put in such strong performance to double again. However, these three stocks have favorable business conditions behind them, and that could help them beat the odds and keep climbing higher in the future.